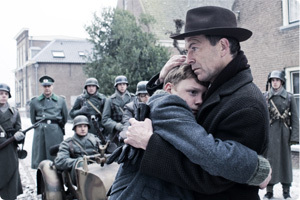 Oorlogswinter (Winter in Wartime) is a Dutch film directed by Martin Koolhoven, based on the book by Jan Terlouw. The film features Martijn Lakemeier (in his first role), Yorick van Wageningen, Jamie Campbell Bower, Melody Klaver, Dan van Husen and many more. The score was composed by Italian composer Pino Donaggio. Before he began writing filmmusic, he was a popsinger/writer who made the hit ' Io Che Non Vivo", earning him eternal fame when big artists began covering it in English. His debut score was Don't Look Now, followed by scores such as Carrie, Body Double, Giovanni Falcone and Trauma and La Monaca Di Monza. 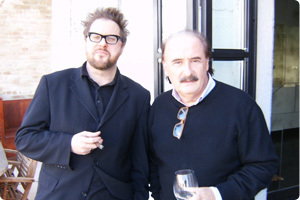 He has collaborated with distinguishable filmmakers like Brian de Palma, Dario Argento, Giuseppa Ferrara and Tinto Brass. The story takes place near the end of World War II in the Netherlands. We follow a 14th years old boy named Michiel who's desperately searching for some adventure and wants to join the resistance. His father, and mayor of the town, is annoyed by his son's behaviour, because he wants nothing else than to preserve the peace. When Michiel suddenly gets an assignment from the resistance, he's determined to carry it out. The film gala premiere took place on 20 November in the Netherlands, with the composer present. The theatrical release was on 27 November. Somewhere in April of 2007 director Martin Koolhoven contacted me while he was working on the script of Oorlogswinter. He asked me if I could help him with selecting music for inspirational purposes. About two months later I started to aide him in his search for an appropriate composer. I looked for composers from certain European countries and aimed at providing sufficient amounts of music, and sometimes show reels. The director also wanted to hear some restrained, melodic material by Donaggio, so I provided him with some selections of scores like Carrie, Il Carniere and others. In the beginning of December he was seriously thinking of hiring Donaggio, which I thought was a magnificent idea! He loved the scores he'd written for Brian De Palma films like Dressed to Kill, Blow Out and Body Double. His scores brought a certain elegy and romance to the rather rough thrillers that Martin was very fond of. He became a fan and started to follow his career. Martin had wanted to hire Donaggio for a long time, but waited for the right project. He just thought that they couldn't afford hiring him for Oorlogswinter. After having send him ways of contacting the composer, the script was send to the composer. Donaggio was interested and had done some research on the director and his films. But Martin was too busy to travel to Venice, so he was trying to arrange a meeting in the Netherlands. Then he announced that he and Job ter Burg (the film editor and friend) would go to Venice on the 25th of January 2008 to meet Donaggio face to face. A friend of the composer was there to translate. Martin discussed what he was looking for in terms of pathos and lyricism and Donaggio was even more interested. Martin and Job were there with the intention of really persuading him to do it, but weren't aware that Donaggio had already determined to score the film. But the producer had to come to an agreement with Donaggio and that took time. In the meantime Donaggio and the filmmakers kept in touch through a lot of emails and some phone conversations. Then the shooting of the film had began and the editor and director had a compiled rough version of some scenes. Donaggio wanted to see something to get a impression, even if they were a mere collection of photographs. The composer began writing themes on the very few scenes that had be edited. Some time later a rough cut version of the film was send to him and he had to adjust his music. He also wrote a sample score to another version of the film. So Donaggio saw the film going through its many changes and he and the filmmaker(s) met several times and kept in touch through emailing. In the beginning of May a teaser trailer was launched, using generic music from the Branch X Music Library. Donaggio's music wasn't recorded yet, excluding the possibility to use his music. In June a temp score was being compiled by the editor and director, on which I tried to fill in the missing pieces of the puzzle. However, I cannot reveal what was being used. But it wasn't of influence on Donaggio music; he wasn't going to see this temp version. The temp was merely compiled for possible viewings of the film. I was very eager to tell everyone about who was scoring the film, but I wasn't supposed reveal this yet. A press release would officially announce him as the composer doing the music for Oorlogswinter, which came on the 28th of August. The press release included this quote by Donaggio: "I was overwhelmed by Martijn's acting. In combination with the approach Martin had on creating more emotion in the music, I was convinced to do the score." Read our exclusive interview with Pino Donnagio where he talks about scoring Oorlogswinter. The recording (and mixing) of the score was scheduled between 4th and 12th of September. It was recorded in studio 1 BNR, Sofia (Bulgary) and The Bulgarian Symphony orchestra was performing the score. Donaggio did most of the orchestrations himself and the rest was handled by Maurizio Abeni. The director was too busy to go the recording sessions of the score, so he met Donaggio for the mix of the music in Forum Music Village Rome, which took place right after the recording. He though it would be much more useful if to hear the definite score at the mixing stage, instead of going to the recording. I remember getting a message from Martin saying, with great enthusiasm: '' This is going to be the best soundtrack for a Dutch film ever!'. This mix was taken back to the Netherlands to be placed in the film. Job and Martin made a few adjustments in the area of editing , to which Donaggio didn't fully agree to. See some pictures of the recording sessions and mixing. The trailer was launched halfway through October, using the following pieces of generic music: Freedom Fighters vs 1 track from Brand X Music, Lesser Evil - No Choir van X-Ray Dog and Agnus Dei by X-Ray Dog. The editor did consider using Donaggio's music, but decided no to. Of all the composed material, there wasn't really something that had these sharp endings, which can be useful for a trailer. Read Joep's review over at the review section. As soon as Martin and I first met with Pino in his studio in Venice, we quickly felt we were dealing with a very passionate film professional. This a great composer who really loves motion pictures, a real film buff, just like Martin is. One time, when we were having (a marvellous Venetian) diner, Martin and Pino spent hours talking about dozens of more or less obscure Italian movies they loved, which was fascinating. Martin felt he needed Pino Donaggio to score Winter In Wartime to be able to elevate the film on an emotional and cinematic level. We felt even stronger about that after hearing Pino's first demo's of the themes he had created, based on a provisional cut of the picture. I remember saying to Martin that I felt these demos proved the very reason we needed Pino to score this film. Also, the very concrete level of discussing the intention of scenes and music cues can be difficult - due to the complex nature of talking about abstract matters - or even awkward, when you are forced to explicitly state subtle thematical or emotional aspects of a scene in a very concrete way. But Pino so easily understood the most complex points we were trying to make. I think he actually "felt" the movie Martin was trying to realize. I recall that the sessions we had were full of inspiration. The great thing about Pino's music, and especially his score for Winter In Wartime, is the greatness, the grandeur. There is a - probably Italian - sense of lyricism, opera, drama, and emotion reflected in all of what he gave us. Not only in the way the score has been orchestrated (some ideas like the use of a boy soprano were specifically Martin's idea from the get go), but even more so in every theme or phrase Pino writes. This really elevated the whole film, added vital cinematic elements to it, and I am very, very grateful to Pino for that. It was fun to see he owned just about every single version of 'You don't have to say you love me' on cd. Even the German version by our very own Corry Brokken. Well, there were so many nice things; his reaction when a foreigner at another table ordered a cappuccino after diner, our discussion about the Italian genre films, when there was no one there to translate our conversations continued with hand and feet gestures during the night, his enthusiasm for my first musical ideas (the boy's voice), how he responded to the first images, his reactions during the premiere. I was very honored that Pino allowed me to select the music for the cd release and that he let me choose the cue titles. It was the first time he had entrusted this to somebody else. I thought that the soundtrack had to be about 50 minutes long and above all, a beautiful representation of the score in the film. I had roughtly 80 minutes of score to choose from, which was more than Pino had ever written for a film. I began with the cues I thought were most important and significant. The first cue Pino made me listen to, at the time a midi version, was immediately spot on. The film wasn't finished yet, but already I felt he had understood what I wanted to tell and in which direction the music had to go. This was also evident in the name he had given this cue; 'Innocenza'. Everything on the release is presented in its original form, as written by Pino and without the editing modifications done for the movie.